Every marketing leader has to make hard choices about resource allotment and is always juggling top priorities, but increasing conversion rates should always be near the top of the list. 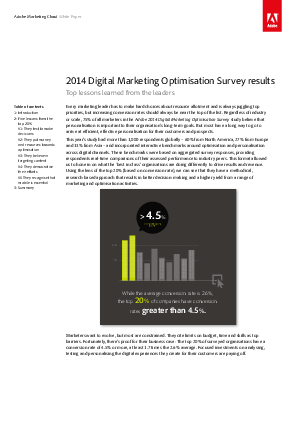 Regardless of industry or scale, 75% of all marketers in the Adobe 2014 Digital Marketing Optimisation Survey study believe that personalisation is important to their organisation’s long-term goals. But most have a long way to go to arrive at efficient, effective personalisation for their customers and prospects. This whitepaper provides five lessons from the top 20% performers along with other important statistics and anlysis of the survery. Download your copy now to find out more.